Does Sisi's Regime Work for the U.S.? 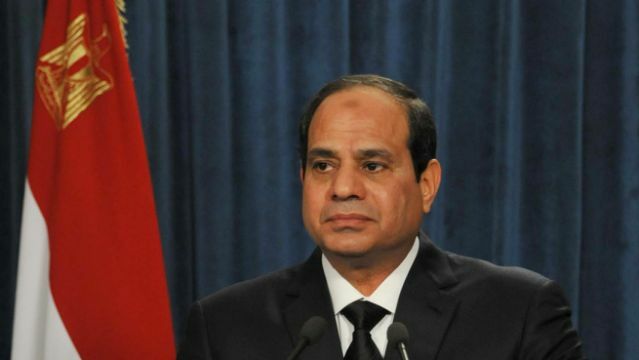 Egyptian President al-Sisi has made some questionable changes since taking power. The new military regime — headed by former intelligence chief, President Abdel Fattah el-Sisi — has come under increased scrutiny by human rights groups for issues such as deaths of civilians while in state custody, brutalizing student protesters and increasingly censoring journalists working in country. The government recently passed a law that broadens the state’s definition of terrorism to include “anyone who threatens public order “by any means,” and allows for security forces to accuse potential terrorists without a trial, even going as far as freezing their assets and preventing them from traveling with only a simple approval from a panel of judges. Do these actions sound familiar? They should. This was the reality for Egyptians for 30 years under former President Hosni Mubarak, a regime closely supported by the U.S. government. While the U.S. generally shies away from what it considers an “oppressive regimes” — such as North Korea, Russia or Iran — in Egypt’s case, the U.S. may view the military-led government as providing a sigh of relief in the tumultuous Middle East and North Africa (MENA) region. Since Tunisian vegetable vendor Mohammed Bouazizi lit himself on fire, igniting the so-called Arab Spring, the landscape that once solidified many MENA countries under stern authoritarian rule transformed into a hotbed of religious radicalism and uncertainty. Libya has reverted to a state of lawlessness and a center for contraband trafficking and jihadist movements following a civil war and the murder of Colonel Muammar Gaddafi. Syria has been plunged into a civil war that has cost the lives of over 200,000 people and provided a landscape for the Islamic State in Iraq and Syria (ISIS) to emerge as a new face of global terror. While Iraq was not specifically a part of the Arab Spring, the country has been marred with an increasingly deteriorating security situation stemming from the U.S.-led invasion in 2003. Given all of these unknown or untested situations and elements, some in Washington may view a firm hand in the largest Arab country on earth as a welcome change. U.S.-ally Israel is certainly enjoying a renewal of relations with its southern neighbor. Since Sisi came to power, the relationship between Egypt and Israel has warmed significantly. Egypt has since destroyed over 1,600 tunnels between Sinai and Gaza and setup a buffer zone along the Egyptian border city of Raffah. Since Hamas is an offshoot of the Muslim Brotherhood, Gaza is finding little sympathy from their Muslim neighbor. In addition, Sinai rebel groups and Islamic militant attacks against Egyptian security forces have forced Sisi to take a more aggressive stance to oust radical jihadist groups from the Sinai. All of these actions certainly benefit Israel in its ongoing security operations in the south. On top of all of this, the emerging U.S. policy of energy independence is driving American security focuses away from MENA. The dwindling number of geopolitical incentives for the U.S. to intervene in MENA means that the American government will likely turn its focus elsewhere. Now that ISIS in Libya has emerged on the scene with the gruesome beheading of 21 Coptic Christian Egyptians in a video released by ISIS on Feb. 15, 2015, Egypt has utilized this horrific event to take the lead in combating ISIS in North Africa. It has begun retaliation bombings of supposed ISIS targets and called for an Arab coalition to battle ISIS, strengthening their hold on Middle East security. So what does this all mean? What it means is that the new Egyptian government will likely face little resistance from global powers given the deteriorating situation of so many other states within MENA and the emergence of brutal non-state actors, such as ISIS. It also provides power to the Egyptian government to continue its crackdown on protesters, journalists, students and Islamic groups with little to no concern for human rights. The U.S. may not emphatically support Sisi’s regime openly, but it is telling that it began providing military aid again just weeks after Sisi was sworn in. The global security crisis in MENA and the unprecedented emergence of new and stronger jihadist terrorist groups from across the region have caused national security nightmares for the U.S. and its allies over the last four years. With Egypt’s new regime, this becomes a state that does not need policing to keep terrorist elements at bay, something that is a welcome change for Washington. While the U.S. may not agree with how the Egyptian government treats its civilians, having a willing power in the region helping temper the storm of global terrorism is not the worst trade-off the U.S. could ask for. Until things begin to stabilize in MENA, the U.S. may just live with a country it can count on for support, regardless of its human rights track record. Daniel is the Executive Director of a non-profit development organization that focuses on building infrastructure and training in rural Sub-Saharan Africa called the African Community Advancement Initiative (http://www.acainitiative.org/) . He has a Master's degree graduate in International Relations with an emphasis on conflict resolution and development in Sub-Saharan Africa. Coupled with his extensive financial background, Daniel also works as a consultant for Consultancy Africa Intelligence in Pretoria and the Centre for Global Governance and Public Policy in Abu Dhabi. In addition to his work at FPA, he is also a regular contributor to The Continent Observer and International Policy Digest. He currently resides in Denver, CO.